In December 2014, I met Dr. Vladimir Marinkovic at the European Parliament in Brussels. He invited me to visit him in the Serbian Parliament in Belgrade, where he is a Vice-President. When I visited him there last week, I discovered that an amazing work of God is going on among leading politicians in the nation. Victor Sabo called my attention to Samuil Petrovski in Belgrade, the National Director of «Evangelical University Students Serbia» (also known as EUS (IFES Serbia and Montenegro). 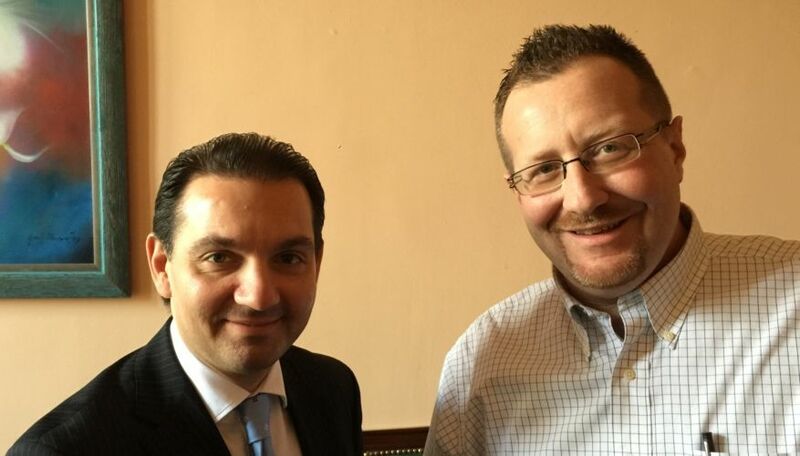 He told me that Petrovski is also the leader of the recently re-established Evangelical Alliance of Serbia. - He is a key leader. said Viktor. When I arrived in Belgrade, I was received at the prestigious Hotel Moskva by Samuil Petrovski, who is a licensed minister within Serbia´s pentecostal-evangelical movement. At present, Samuil is involved in two church-planting projects in Belgrade. Together, we went to the Parliament nearby where I had an appointment with Dr. Marinkovic. However, our time there revealed some stunning facts about the Lord´s work among the elite of Serbia. Dr. Marinkovic told me that he and a group of MP´s meet for prayer every week in Parliament, under the leadership of Samuil Petrovski. - It is very meaningful for us, underscores Dr. Marinkovic. - We understand the need for God in our nation, and we experience that prayer helps. While in his office, we are joined by Dr. Milorad Mijatovic, a professor in mathematics, and the President of the socialdemocratic party, which is a part of the ruling coalition. He is a declared atheist: «I believe in mathematics», he proclaimed with a grin. We are also joined by Ms. Ljiljana Nestorovic, a popular media personality who is a MP from Belgrade. After a very informative conversation, Samuil Petrovski asked Dr. Mijatovic and Ms. Nestorovic if I could pray for them. They nodded. The prayer time was amazing. Clearly, both these Serbian leaders were impacted. The Holy Spirit decended on the Serbian Parliament. This seems to happen weekly there nowadays. - When I started working with Members of Parliament, many of my pentecostal brothers and sisters did not see the need for that, says Samuil. - But now, more and more of us see the need to lift up the leaders of society. It is worthwhile, maintains Samuil Petrovski.